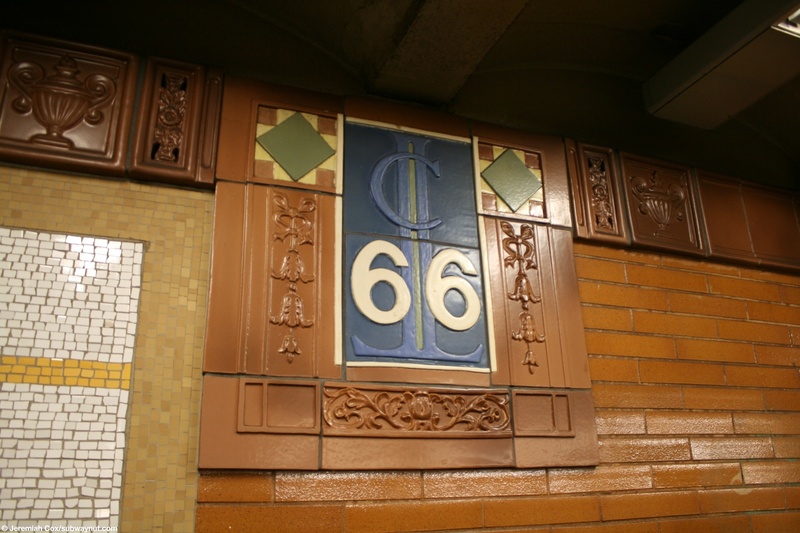 66 Street-Lincoln Center is a renovated in the early 2000s local station that has some replica (and few original) terra-cotta decorations on the platform walls. 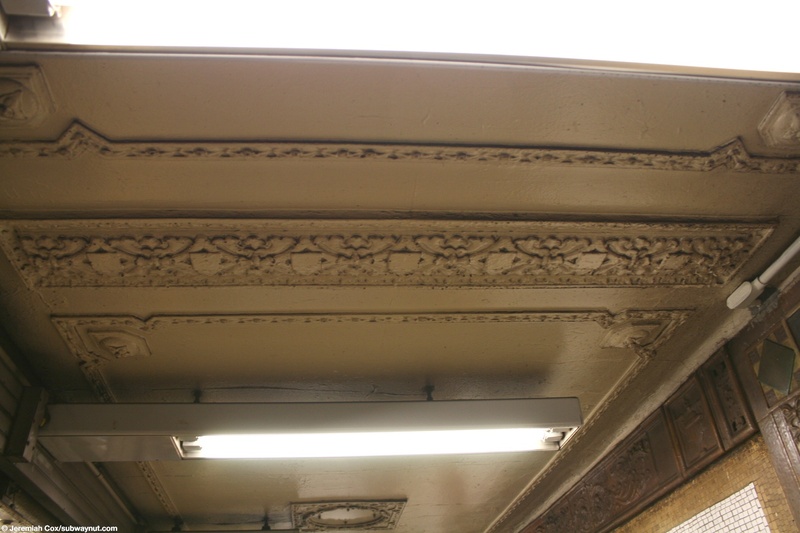 This consists of a wide, brown trim line relief. 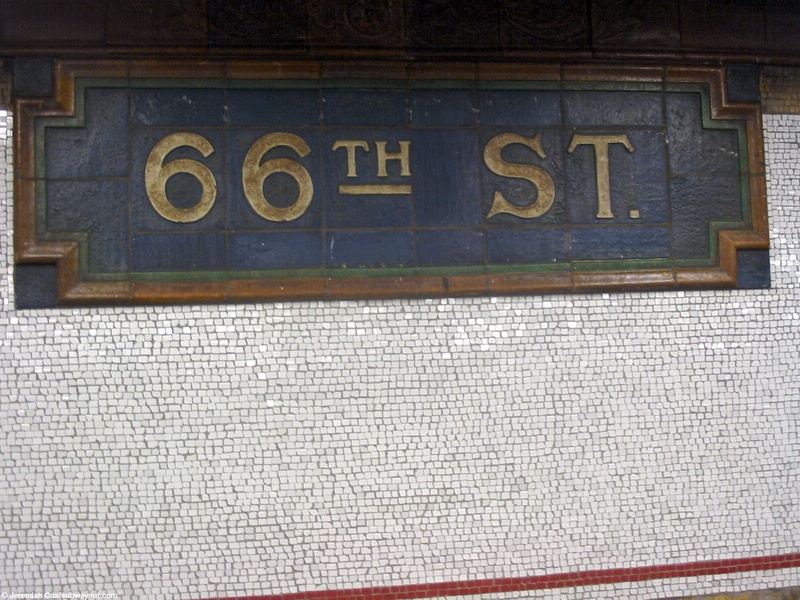 The text in the trimline are white 66s on a blue background, with a wide brown boarder that looks like an extension of it. 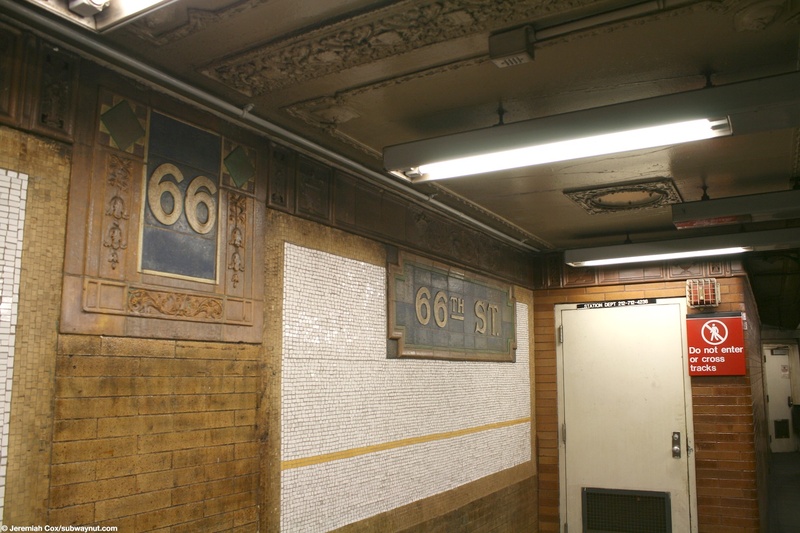 Beneath the 66s (and what makes them definitely replicas) are inside the blue odd interlocking blue CLs. 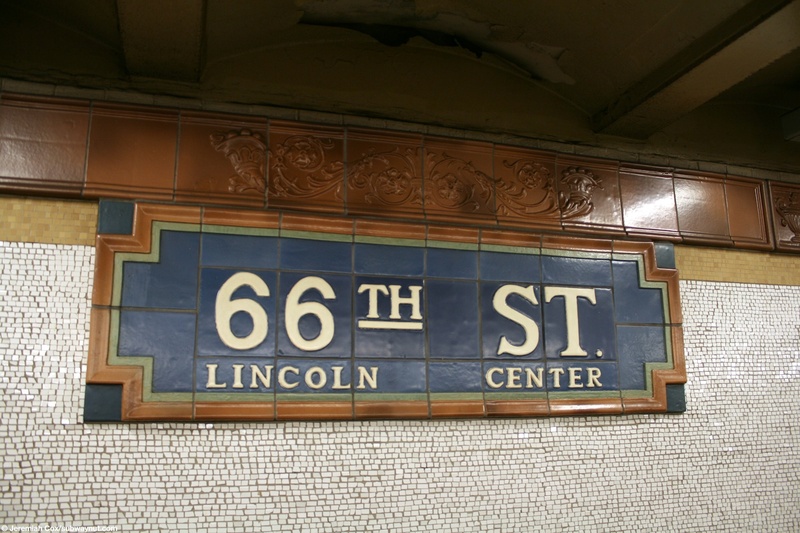 There are name tablets as well which are terra-cotta reliefs just below the wide trimline with a blue background and brown boarder and say 66th St, with Lincoln Center beneath. 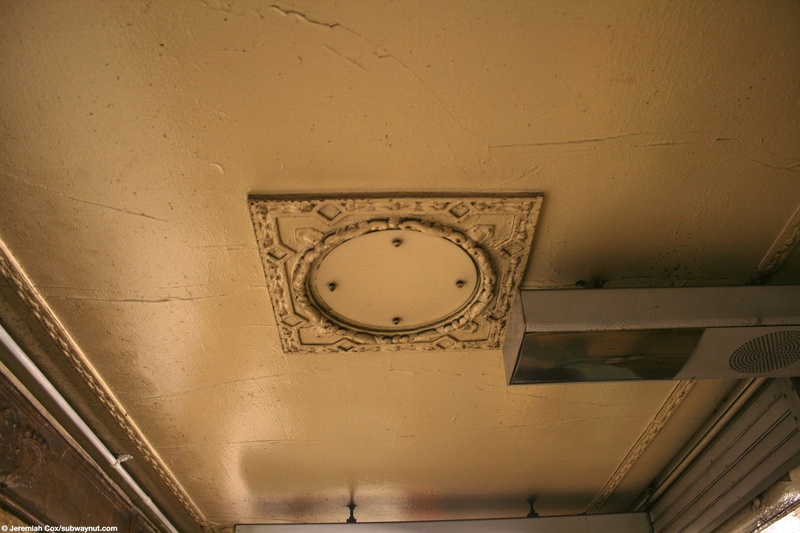 These are definitely replicas because Lincoln Center wasn't built until the 1960s! 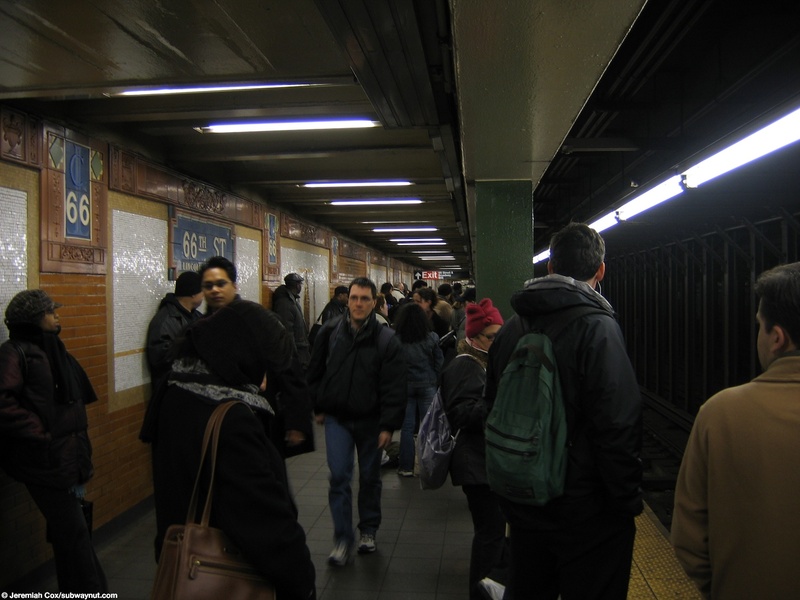 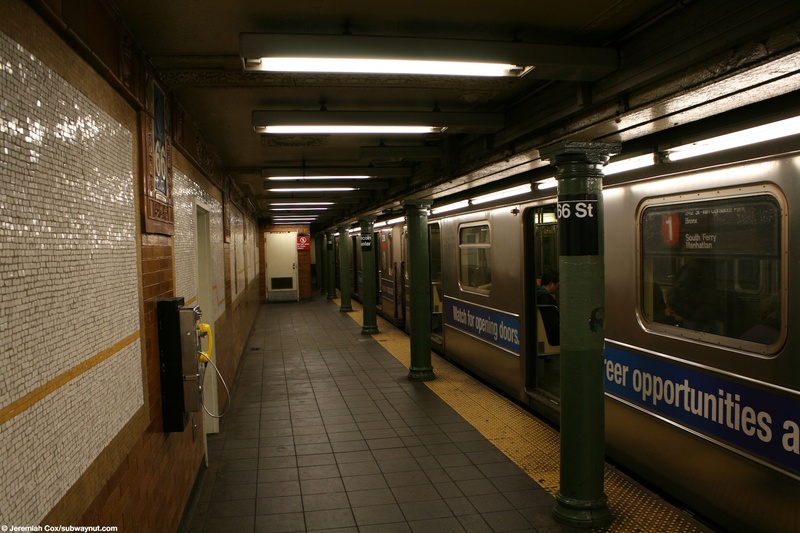 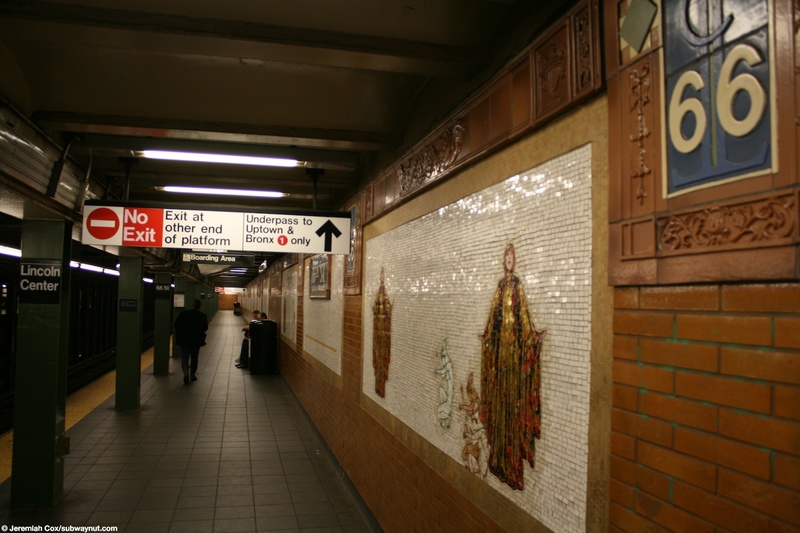 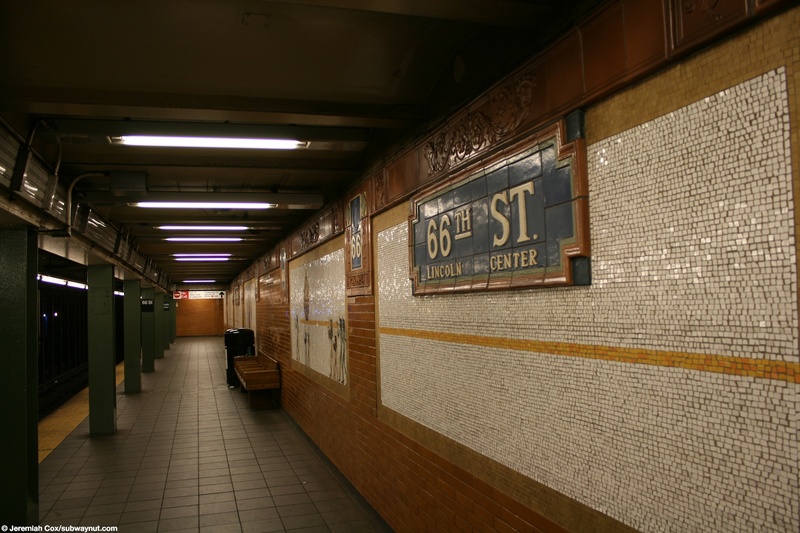 (I also remember the pre-renovation station with the same cream colored block walls and a pink trimilne like what is found at 79th St and 86th St still). 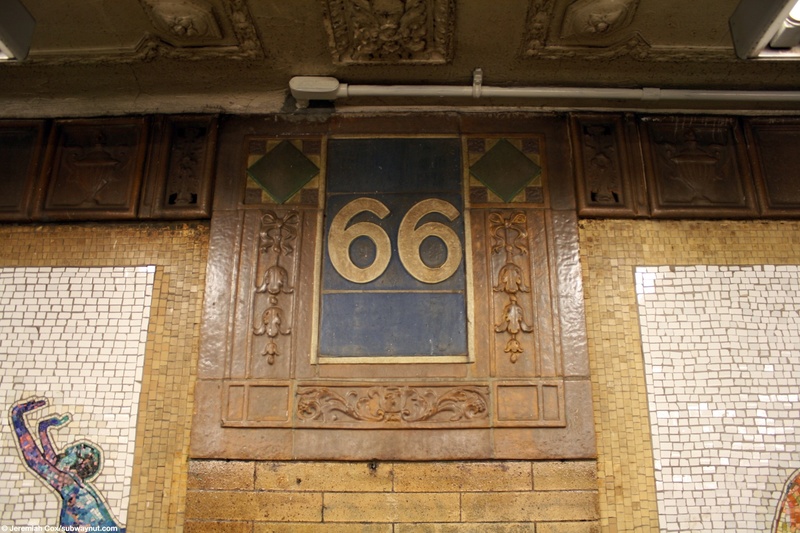 The original station decorations can be found near the station entrance and these look the same (except the white portions of greyed a bit) and are lacking the L.C. 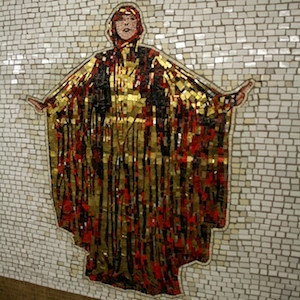 references. 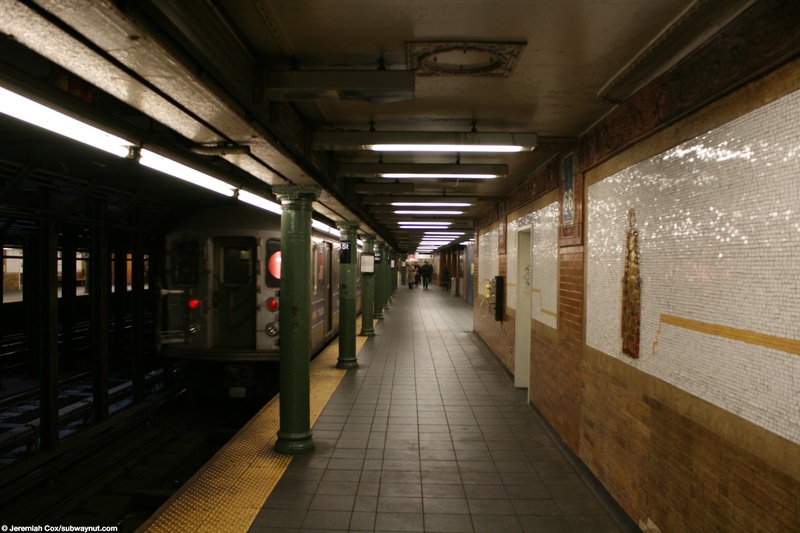 For access each platforms has platform area fare control towards its northern end. 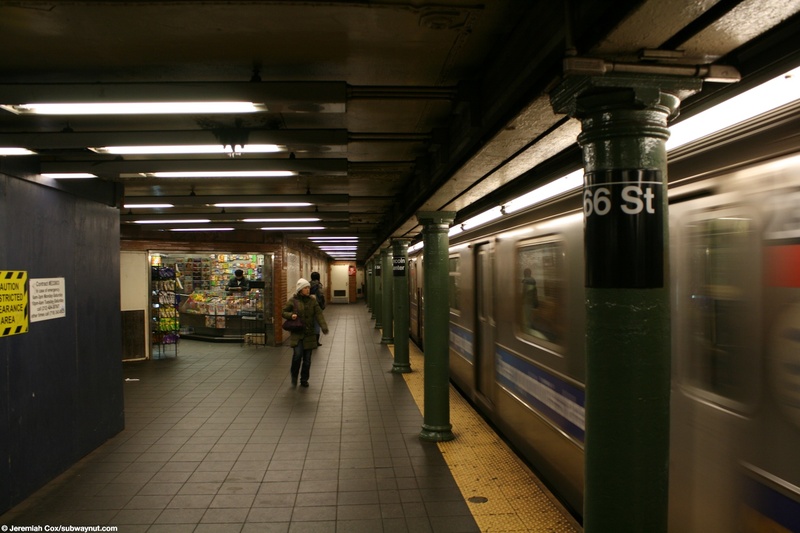 The uptown side is now unstaffed with the 24 hour booth on the downtown side. 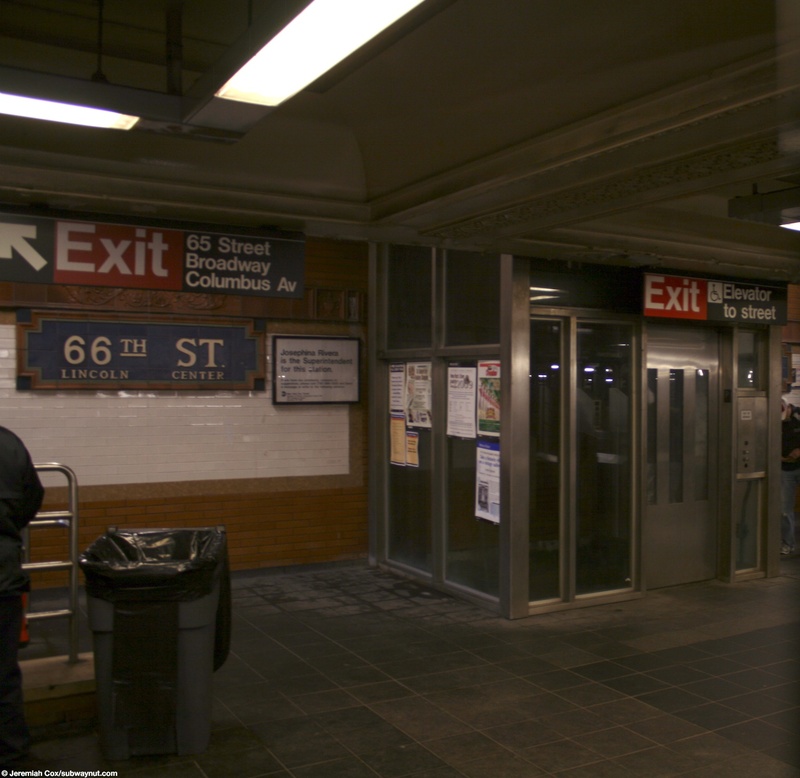 Here two sets of streetstairs and an elevator lead from each platform to each side of Broadway just south of 66 St. 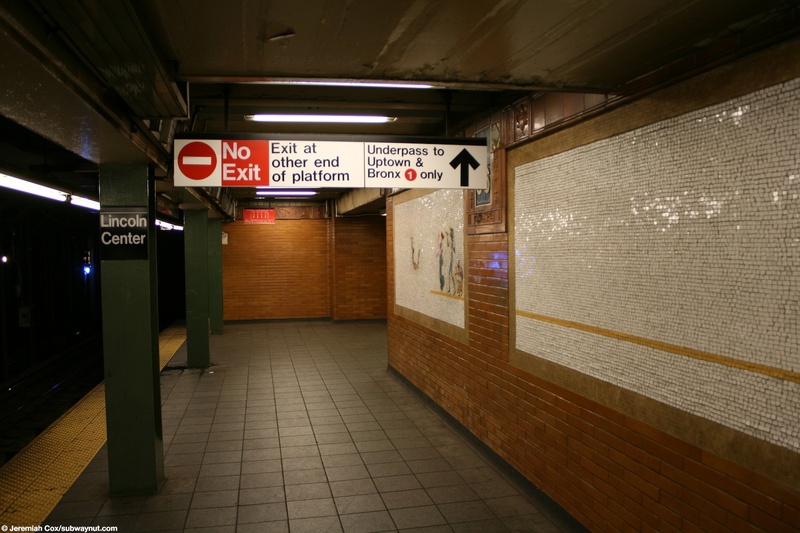 The downtown platform has an additional unstaffed entrance at it's southern end where there is also an underpass to the uptown platform. 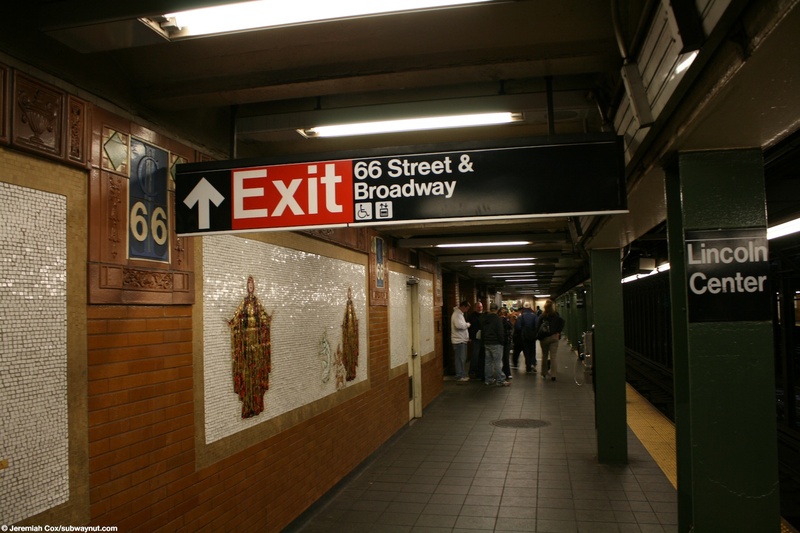 This exit leads out to an underground passageway into Lincoln center and a streetstair up to the SE corner of broadway and 65 street alongside the driveway and drop off road into Lincoln center.